Signed Giclee Art Print on Acid-Free 200 GSM / 10mm Paper. 8.5" x 10.5" (including the white border). It comes with a signed Certificate of Authentification, rolled or flat between boards, securely packaged in a box or a tube. The original painting(sold) was done for a Mona Lisa Group Exhibition in San Francisco's Modern Eden Gallery in 2013. 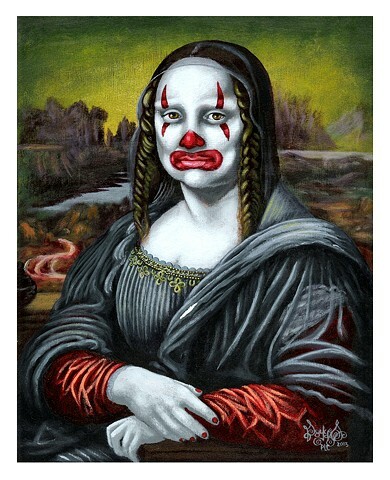 It was later featured in the book Mona Lisa Reimagined by Erik Mael. L'oeuvre originale(vendu) a été faite pour une exposition collective au thème de Mona Lisa à la Galerie Modern Eden en 2013. Elle a ensuite été publiée dans le livre Mona Lisa Reimagined par Erik Mael.